172 Lukie Points will be rewarded to you when you buy this. Original NES Nintendo Top Loader System. This system has been cleaned and thoroughly tested - it works like new! The top loader Nintendo System was released in 1993 and was the redesign of the original NES. The new design offered many improvements over the original Nintendo, most notably eliminating the common problems such as blinking, flashing screens. Super good condition! Everything works properly and look like new! Thanks a lot Lukie, Your shop is just wow! I’ll shop here again again. The system was in very good condition very clean. The system is much more reliable that the original NES and every game I put in it works including the Everdrive, Homebrews, PAL Region games and multicarts. The system only has RF out so the picture doesn't look so sharp but that is too be expected with these old systems. Overall if your looking for a original Nintendo product to play your NES games I would definitely get one. *With far greater consistency than its predecessor NES-001 'Toaster' model, the Top Loader (model NES-101) is an outstanding performer that will not let you down as it handles virtually any game you choose, each and every time! It is compact, lightweight, and truly effective maintenance is much easier to provide the unit with. Note: The 101 is not equipped with a power-on light/led. My wife bought this last Christmas for me and I absolutely love it. It is true, the picture quality on the Top Loader is not as good as the Toaster version but that was easily fixed. I had an old/busted SNES... I took the Multi-out adapter, looked online for a tutorial on how to create a board to convert the RF signal to AV, a little solder here and there... and now I have a 100% rock solid NES system with a great picture. My daughters love playing on this system and they don't have to fuss with the cartridges in any way. It just works!!! And as always, Lukie Games provides a level of service and quality that is unmatched. I've looked at these on Ebay going for hundreds of dollars and then ran across Lukie. I knew they would stand behind there machine. The machine has worked flawless and I love it. This is coming from someone who owned the original (toaster) NES system. I also purchased two dogbone controllers with it so the system would be as original as it would have been if I purchased it new from the store. The only problem I have found is that you can't use the Game Genie with the top loader unless you have the adapter which is extremely rare. Even Lukie doesn't have them for sale. I had to purchase one on Ebay for $160.00 which was more than this system costs. I am very pleased with this purchase. This console is compact and most importantly it's reliable. For the best picture quality keep the toaster, but for reliability the top loader is king. I paid 90 bucks shipped for this combo and it was completely worth it. The system works great, had no cosmetic flaws and came with perfect working, albeit old-style, controllers. But I have no complaints and give this a perfect score. I play a lot of nintendo games. I would say it takes up the bulk of my time. Thus it was a no brainer to buy a top loading system. I remember years and years of blowing into the front loading systems as a kid. Now being an adult I can do something about that and bring on the fun without the heart ache. I have never had problems with my top loading console I purchased from Lukie games, and would highly recommend it to anyone who is committed to the classics. The system is perfect. I had an old NES that was barely working but a wealth of games. This top loading system consistently works every time. There are a lot of NES/SNES clones out there, but nothing compares to the real thing. 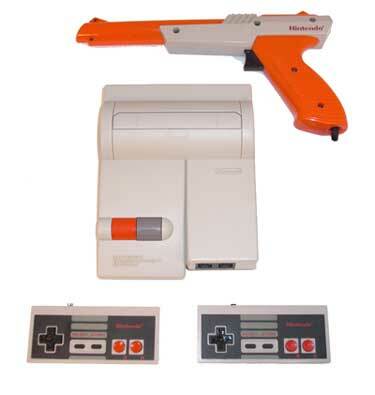 It is compatible with every NES accessory and plays any game in your collection. Awesome product and quick service. This NES Top Loader is a good looking and a great working system. It works every time! Thanks for such quick service! The product came to my house before the scheduled time. Thanks so much! Guys, use Lukie Games. They are great! The systen works well, BUT ONLY HAS RF OUT!!! Oddly enough, if you look at an old toaster NES with RF cables it looks better. The video quality on the NES Toploader is downright horrible. Odd vertical lines plague the screen, making sky look like blue wallpaper, and white colors bleed to the right making reading text a chore. I'm looking into how to modify the console to have AV outs. I bought this and man,am I impressed.It worked quite well when I took a qtip to my old games it worked beautifully,although it still crashes from time to time,I give it 5 stars.